The leader of the Catholic Church has been quietly sneaking out of the Vatican at night to minister to homeless residents, according to a new report. “Swiss guards confirmed that the pope has ventured out at night, dressed as a regular priest, to meet with homeless men and women,” writes The Huffington Post. The report hinted that Pope Francis had sneaked out of the enclave with Archbishop Konrad Krajewski. As Almoner of His Holiness, Krajewski is the Vatican’s point person on giving charity to the poor and visits the destitute nightly. Over the years, the Catholic Church has grown too “obsessed” with abortion, contraception, and gay marriage, Pope Francis argued in May, imploring followers instead to focus on combating trickle-down economics and the world of inequality it produces. 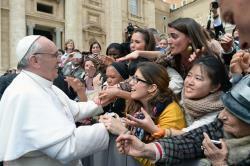 Read More Pope Francis Sneaks Out Of The Vatican At Night To Serve The Homeless | ThinkProgress. This entry was posted in News from the Soul Brother and tagged Almoner, Catholic Church, homelessness, Pope, Pope Francis, Swiss Guard, Vatican. Bookmark the permalink.